“Joy to he World” is a popular, beloved and perhaps the most published Christmas Carol. Its author Isaac Watts did not write it with Jesus’ birth in mind – it’s not even mentioned. It was published in a collection of hymns inspired by the Book of Psalms and interpreted through Christian eyes as an affirmation of the whole creation filled with new life: Fields and floods, rocks-hills-plains repeating the ‘sounding joy’ refers to Ps. 98 where heaven and nature sing. Watts conveyed crucial insights in the Judeo-Christian tradition: That our Creator ‘rules the world with truth and grace, and makes the nations prove the glories of his righteousness and the wonders of God’s love'”. As Mother Mary learned…we have much joy, mystery and love to ponder here. If the sweetness and grace of the Christmas Story does not reach our hearts it is as mere ocean spray – a blast on the surface that never touches the deep nor calms the heart. Family Service at 5:00 pm — Guest singers/musicians/actors – pure joy! Candlelight and Communion at 10:00 pm — contemplative and soul-stirring. Christmas Day Worship at 10 am — another celebration filled with joyful carols! Our Secret Santa Gifts and Gift Cards were delivered on Tuesday. Thanks for sharing so much love with those in need! Christmas Caroling: Gary and accordion will lead the way on Sunday, December 23. We leave Peace at 5:30 to serenade members and arrive at San Damiano by 6:45 to sing for the Camp Fire families. Blue Christmas Services and Holiday Candle Ceremony: Martha has sent us Christmas Resources for those facing grief and loss in this season of darkness. See attachments below. Our Christmas Tree has been voted Best Christmas Tree Ever! Runner-ups include the Christmas Trees from 2011, 2007 and 2013. The Song “Silent Night” celebrates its 200th anniversary this Christmas! Our Monastery Honey has nearly disappeared. Great gifts and so tasty! Christmas opportunities for Service: San Damiano Retreat Center has opened their facility for Paradise Fire Victims. If you wish to Volunteer to assist the days most needed are: December 24 and 25. You can also wander up the hill at any other time these next few days and see where they need help. Entre Culturas News/Partnership: On the firs half of October they get a lot of rain on Laurel Galan but then the rains stop all together and therefore it was not enough. There will be no harvest of corn but there will be plenty of food for the animals. The harvest of sorghum will be good. There is plenty of water on the wells. One well was dug to start the water project for the community…they are still waiting on the rest of the project. The women are going to have enough food to cover all of December.The cutting and selling of firewood is still slow. YEAR END CONTRIBUTIONS: Please have all year end contributions into the office by, December 31st. Peace Office will be closed Dec 25 – Jan 2. We will see you in the New Year! 2019 office hours will begin a new schedule: Tues, Wed, Friday: 10a – 6p. Most Thursdays with Pastor Steve, and by appointment. Blessed Advent and Joyful Christmas! Christmas Eve: Family Service at 5:00 pm …. Who will be the Baby Jesus this year? 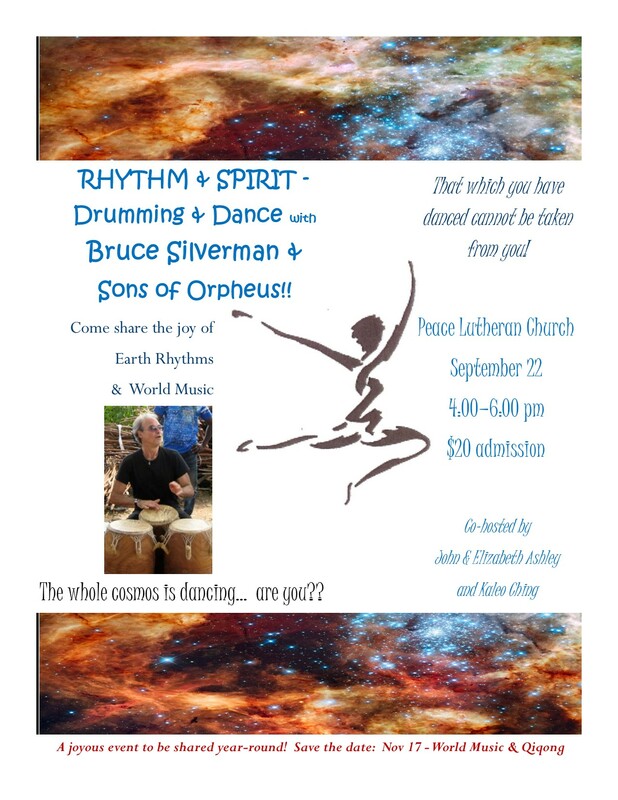 Guest singers/musicians/actors will fill the evening’s Story with delight! Secret Santa Gifts and Gift Cards: Please bring your Gifts/Gift Cards to Worship this Sunday, December 16. The families live in Antioch, Pittsburg, Bay Point, Oakley and Concord. Please wrap your gifts and mark them with Family Name, Gender and Age of Child. (For example, BAY Family. Girl 7 years.) A small group will drive to Martinez on Monday or Tuesday to deliver the gifts. The Catechumenate (Adult Faith Deepening/Clarity of Calling) has begun. A few other members may join in. Keep Fei in your prayers and those who are contemplating participating in this time of discernment. Sing-Along Messiah with the Contra Costa Chamber Orchestra and our own Elizabeth Hunter Ashley! 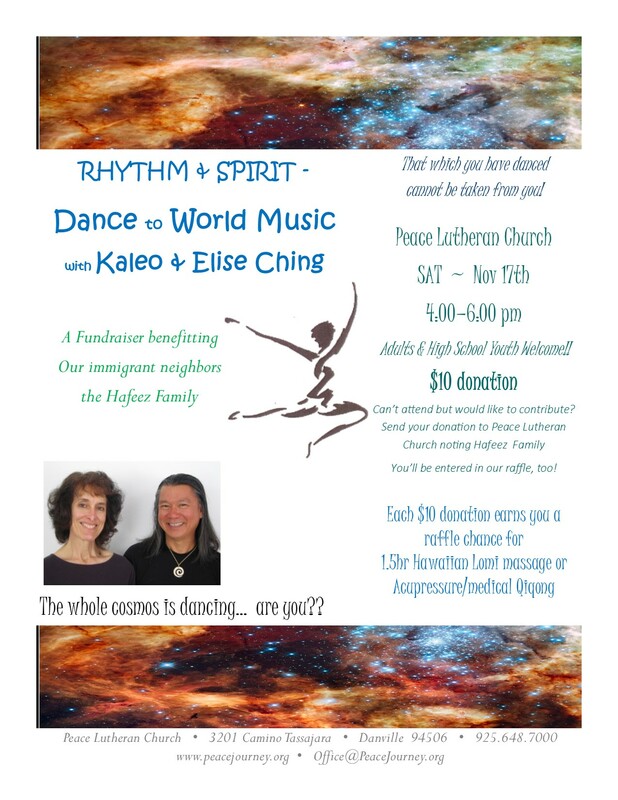 Sunday, December 16, 7:00 pm at the San Ramon Community Center, 12501 Alcosta. 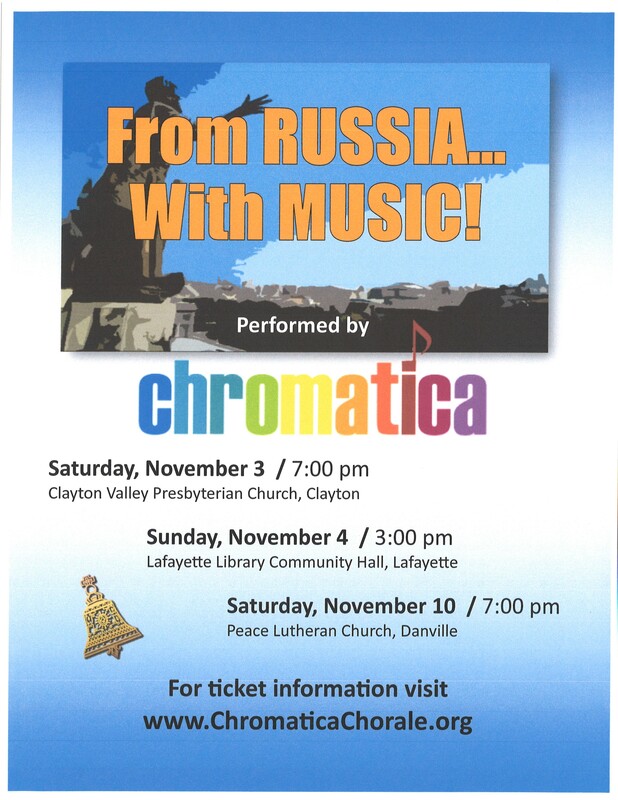 www.San RamonArts.org for tickets. Christmas Caroling: Gary will once again lead the way with his accordion as we sing cheer at the homes of members of Peace. We are hoping to conclude the evening with Caroling for the Camp Fire families residing at San Damiano. 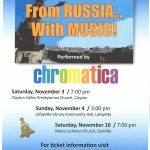 All are welcome to join in – singers and non-singers!! Thanks to the Women of Peace and Ken who have decorated our Tree and the Gathering Hall! San Damiano Retreat Center is opening their facility for Paradise Fire Victims. 78 people can be housed. If you know anyone who needs a place for the holidays please notify Lisa at San Damiano promptly. Her number is: 837-9141. If you wish to Volunteer to assist the days most needed are: December 20 and 21 when people arrive and December 24 and 25. Contact me if you want help. Winter Nights Shelter: in late January or early February we will provide hospitality (a meal, homework assistance, being present) with friends from Beth Chaim at St. Timothy’s Church. More details to come. Entre Culturas News/Partnership: Eduardo and the women did the trip to a place call EL SALTO – which is a river that has waterfalls and some swimming holes. 22 women and 6 children came on the trip. They had lunch in El Salto ( fish filet and juice – according to the women it was very good.) The women had a blast especially because they do not have the chance to leave the community to go on trips like this. Micaela and Emelina came on the trip. Emerita seemed to most enjoy the trip…on the way back to Laurel Galan, since they had to go trough Managua, the bus take them to the main avenue in the city for the women to see all of the Christmas Lights and the Altars that are especially prepared for the celebration of the Concepcion of Mary. The Third Sunday of Advent arrives this Sunday when we light the pink candle – a symbol of joy for all the people who cannot wait for Christmas! San Damiano Retreat Center will host Paradise Fire Family victims from December 20 – 26. Several people from Peace already want to volunteer to help. (*Please see the details below.) If you wish to assist please notify Kari in our Office. 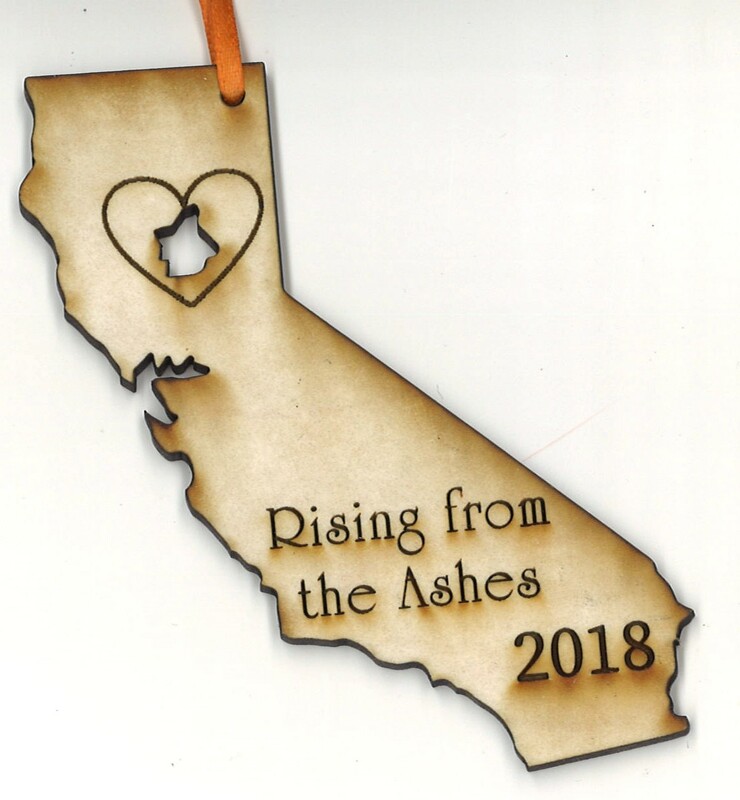 These ornaments are being made/sold with all proceeds benefitting fire victims. Prayers please for all my sister Elin and her husband Harry had to endure. They lost their home and all of their belongings in the Paradise inferno. My 85 year old brother in law drove through walls of fire and blinding smoke, the morning of the uncontrollable conflagration of super-heated air, moving fast with the wind, setting one house after another on fire, leveling everything in its path. Elin and Harry reached her daughter’s home in Berkeley late that horrible Thursday. The sights of Paradise are far worse than what we saw in Europe during the war. At least the bombs spared some houses, leaving behind ruins that could be rebuilt. There is nothing in Paradise like that. Our Advent Wreath was designed by Ken and it is fabulous. What an inspiration to prayer as we mark this season of preparation for unconditional mercy. 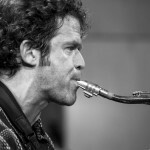 Jazz Church West: Anton Schwartz and Mike Scott were stunning. The gospel is ‘preached’ in so many ways. 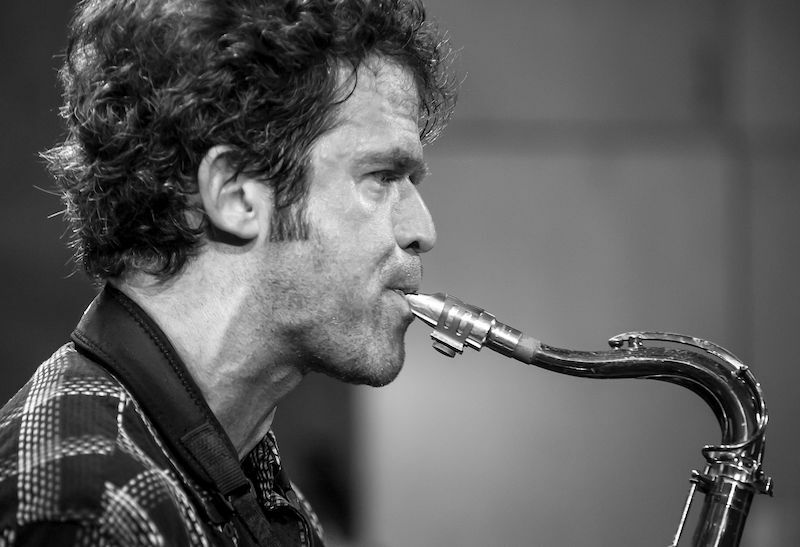 (Be sure to tell me the day you grow weary of classical and jazz artists performing at Peace who have played the great concert halls of New York, SF Symphony, Vienna, Sao Paulo, Seoul, Tokyo, Berlin, Stockholm, DC and LA.) We are so blessed! Giving Tree Gifts are asked to be brought to Peace on December 16. Gifts for two 9 year old boys are the only remaining gift requests. The Catechumenate is an opportunity for Adults to deepen their faith through study, reflective conversations, prayer, godfriends and blessings. It begins in Advent and continues through Easter (April 21). We meet twice a month and the participants determine together our meeting times. Speak with me if you would like to learn more. first half of the rainy season we lost the harvest due to lack of rain and right now we are losing our crops due to excessive rain. We hope that you will be successful in your elections and that you choose the best candidate for you. We pray that you will always be well and that you can achieve your goals. Keep in your prayers: June, Spoon, Margaret, Gun, Nette, the people of Paradise and Thousand Oaks, the Seminarian Committee, Brenda, Kathy and Adel, Bernie, Jeanne, children who are at risk, Pr. Margareta, people living with AIDS, those in addiction recovery, artists and all who are with child. 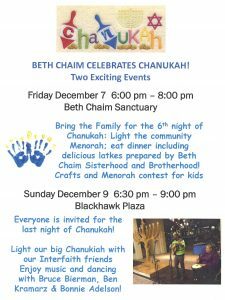 Chanukkah Celebration this Sunday: Beth Chaim invites you to an interfaith Chanukkah Party with Menorah Lighting, singing, dancing, hot chocolate and goodies at the Rotunda in Blackhawk Shopping Center this Sunday, December 9 at 6:30 pm. Always a great time! From the New Life Band: Friends at Peace we offer a sincere thank you for welcoming us last September to Peace during our California Tour. Your support, warm hospitality and the opportunity to share our ministry with you was greatly appreciated and valued. 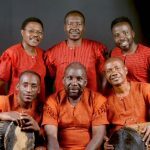 Mungu awabariki! 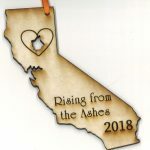 Fire Victims – A Place for the Holidays! San Damiano Retreat is opening 78 guest rooms to host fire victims over the holidays! Rooms, meals, laundry, wifi, beautiful grounds, and a warm Franciscan welcome. How YOU can help: Contact Lisa Briones lisab@sandamiano.org or 925.837.9141 – or contact Kari in the office to schedule a group to assist in any way! o Bring your musical talents to entertain the guests! 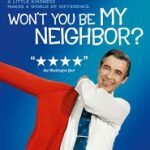 ~ “Won’t You be my Neighbor” – Last Friday Films: Dinner and a Movie with Kenny’s Roast Chicken at 7:00 pm (note our later start!). 2018 is the 50th Anniversary of Mister Rogers’ Neighborhood. 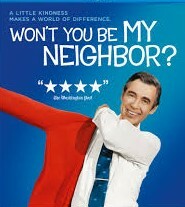 Come and enjoy this delightful film about the man who cared about all children. “The friendship of wise ones is tasteless as water. The friendship of fools is sweet as wine. 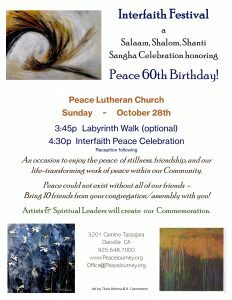 ~ November is Stewarding Month at Peace! 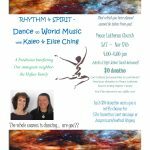 ~ Rhythm & Spirit: SAT Nov 17th, 4:00p – Dance to World Music with Kaleo Ching! This is a fundraiser for a refugee Afhgani family. $10/person. Check out the raffle! ~ Peace served as a Polling Place for the Elections this week and approximately 1,000 people voted here. There was a constant flow of voters throughout the day. ~ A Call for Change: For the month of November, the Arts and Culture Commission of Contra Costa will be featuring “A Call For Change”, an exhibit of PhotoVoice artwork that brings together photos and messages from people experiencing homelessness in Contra Costa County. The artwork will be displayed in the lobby of the County Administration Building at 651 Pine Street in Martinez for the month of November. It is serene. Empty. Solitary. Unchanging. Marvelous and transcendent moments this past Sunday with our Psalm, “Taste and See” and Eucharist. God is good. Communion of Solitudes: Our Forum revealed how essential silence and solitude are to the members of Peace. Without contemplative stillness our clarity disappears, decision-making gets foggy and commitment to act on our values flags. Henri Nouwen said, “The church is a communion of solitudes.” We bring our inner stillness to one another and this creates the wisdom and peace of the spiritual community. Meditation at Peace (from 6 – 6:45 pm) begins again on Thursdays, September 20. It includes 10 minutes of Kinhin/Walking Meditation. If you cannot participate but would like to learn the basics and intention of Meditation practice, please contact me and I will gladly teach you. 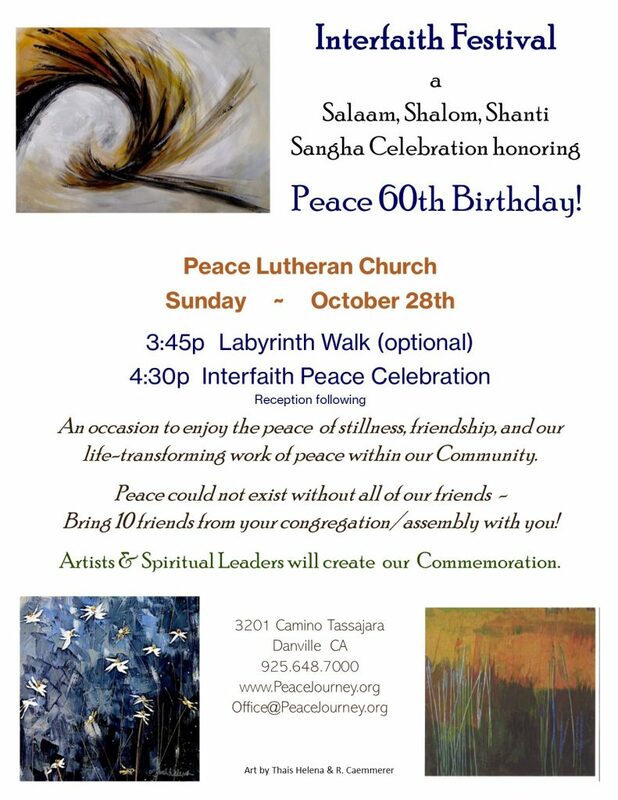 Save the Date; Peace 60th Birthday Party – October 28: Worship in the morning and an Interfaith Festival – Salaam/Shalom/Shanti Sangha Celebration – at 4:30 in the afternoon! 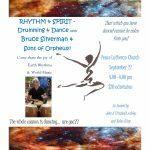 Rhythm and Spirit: — Bruce Silverman leads our next Embodied Prayer Event with a Drumming Circle on Saturday, September 22 from 4 – 6 pm. When ancient Israel collapsed and went into Exile, the Babylonians refused permission for the Jewish people to bring their drums with them because the drums would give them hope, energy and courage. Are you ready for some joyful energy?! And you are invited to bring your children and grandchildren who will never stop thanking you. The High Holy Days conclude with Yom Kippur on September 18. Anti-Semitic fliers were posted at or near five Bay Area synagogues ahead of Rosh Hashanah. The fliers with vile caricatures and comments were from the far-right website Daily Stormer. We remember the martyr Stephen Biko who was murdered 41 years ago this week by the South African apartheid regime. Biko was the founder of the Black Consciousness Movement and the author of “Frank Talk” a profound collection of reflections on restoring dignity and consciousness to oppressed peoples. Stephen Biko was also a close friend and inspiration for Tshenu and Mudzunga Farisani. Keep in your prayers: June, Margaret, Bernie, Shivani’s father, the 90 countries participating in Eco-Summit Gatherings around the world; Denise, Laura Patterson on the death of her mother Phyllis, Samantha and John who will be married this weekend. 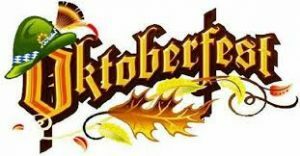 Homecoming Sunday – September 23! 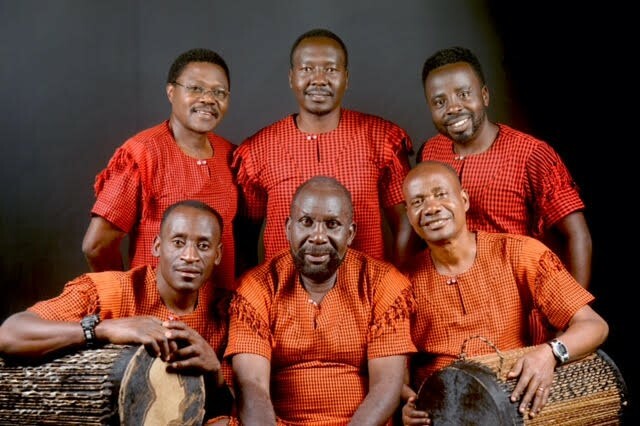 The New Life Band from Tanzania will lead our worship that day. Friends from Tanzania, Rwanda and hopefully South Africa will join us for worship. A tasty Luncheon of Tanzanian and American foods will follow with a selection of African crafts available for purchase, too. Anticipate a joyful day! Invite friends to join you. Tai Chi Chuan Classes (a 12 week series) begins on Thursday, September 20 at 7:00 pm. An open mind and loose clothing are all you need. Tai Chi combines physical exercise, martial arts and meditation in movement. Tai Chi means The Great Uncontainable in Form. Check it out, spread the word. If you forget to be grateful for your life – read the Psalms. They will renew you with deep, exuberant praise for the gift of now!